Figure: Gas pressure related size dependency of the contact units. Abstract: Lithium ceramics have been considered as tritium breeder materials in many proposed designs of fusion breeding blankets. Heat generated in breeder pebble beds due to nuclear breeding reaction must be removed by means of actively cooled plates while generated tritiums is recovered by purge gas slowly flowing through beds. Therefore, the effective thermal conductivity of pebble beds that is one of the governing parameters determining heat transport phenomenon needs to be addressed with respect to mechanical status of beds and purge gas pressure. In this study, a numerical framework combining finite element simulation and a semi-empirical correlation of gas gap conduction is proposed to predict the effective thermal conductivity. 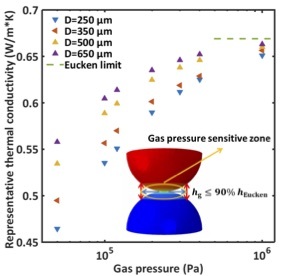 The purge gas pressure is found to vary the effective thermal conductivity, in particular with the presence of various sized gaps in pebble beds. Random packing of pebble beds is taken into account by an approximated correlation considering the packing factor and coordination number of pebble beds. The model prediction is compared with experimental observation from different sources showing a quantitative agreement with the measurement. This entry was posted in Publications and tagged heat transfer, nuclear fusion, publications. Bookmark the permalink. Post a comment or leave a trackback: Trackback URL.